Fermoy took the U-14 “B” county title when they defeated Douglas in a rip roaring game played in Watergrasshill on Friday evening. The result of this tie was in the balance until the final whistle but Fermoy hung on to deservedly take the title. Fermoy playing with the aid of a very stiff breeze were first out of the blocks and had the ball in the Douglas net after only three minutes when their star forward Laura Sheehan hit a cracking shot from a long way out that went all the way for her first goal. Elaine O Donnell followed this with a point before Sheehan hit her second goal after great team play, working the ball all the way up the field. Douglas eventually settled down and moved the ball well and Emer McAndrew opened their account in the thirteenth minute. The next ten minutes was end to end great football before Rachel Dean goaled for Douglas from a close in free and Aoife Kelleher followed this up with another goal after a rebound from a good save by the Fermoy keeper Caoimhe Moore. Fermoy now knew they were in a match and full credit to them came down the pitch almost immediately and Laura Sheehan goaled in the twenty sixth minute. Fermoy forwards now working as a unit, passed the ball well supplying Seeehan to allow her to score two further points before half time. Douglas turned with the wind at their backs and started to play better team football. Their mid field pairing came into the game a bit more and gave fine ball to the forwards, Aoife Kelleher narrowing the gap when she scored two points from frees at the start of the half. Eadoin Downey followed these with long range points. Fermoy backs were under sever pressure but stuck to their task well with Molly O Sullivan in the centre and Ellen Murphy on the wing both playing very well and this reduced the pressure on the inside line of Aisling Healy, Ali Moor and Sinead O Brien, who also were on top of their game. 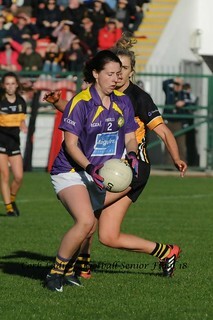 The introduction of fresh legs was a key factor as the Fermoy selectors saw some of their players were tiring. They say that the width of a post can decide the outcome of a match and this is probably true of this final, a cracking shot from corner forward Eimer Cotter for Douglas hit the upright in the twenty third minute and from the rebound Fermoy went up the field in a swift passing movement and their corner forward Caitlin Flynn goaled at the other end. Fermoy could now smell victory and pointed from the resulting kick out. Douglas did not panic and were almost camped down in the Fermoy half for the remainder of the game but were guilty of over elaborate passing movements and some very poor wides. They did manage to score two further points but it just was not enough to deny Fermoy a famous and much deserved victory. Jerome Casey treasurer of the board in congratulating Fermoy said that the four county finals at U 14 grade were played this week and the best wine was kept till last. 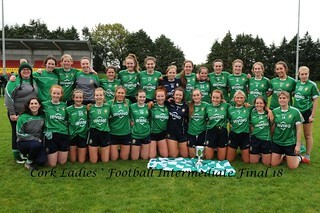 This game had it all, tough open football played by two fantastic teams who both wanted to play great ladies football Fermoy Caoimhe Moore, Ali Moore, Aisling Healy, Sinead O Brien, Ellen Murphy, Molly O Sullivan, Aine Fanning, Elaine O ‘Donnell (Capt), Danielle Collins, Lisa Geary, Emma Harrington, Eve Buckley, Sara Kenny, Laura Sheehan, Graine Daly, Anna Dunne, Catlin Flynn, Meave O Callaghan, Jenny Murphy, Megan Quigley,,Alison Flynn, Fiona Scott, Alice O Driscoll and Sinead Fenton. Douglas Niamh Daly, Sonora Seile, Megan Daly, Rebecca Nagle, Ciara Hayes, S Hannon Wynne Rachel Oraide, Eimer McAndrew, Eadoin Downey, Emer Kelly, Aoife Kelleher, Alannah O’Neill, Eimear Cotter, Rachel Dean, Olivia O’Connor, Laoise Cahill Duggan, Jill Doneghan, Lia O’Brien, Rebecca Cunningham, Niamh Duggan, Aleksandra Hanusezewic, Alison Dorgan, Alison Anthony, Aoife Horgan ,Aoife O’ Leary Chloe Travers, Deirdre Lynch, Ellie Devine, Emma Roche, Gwen Kelleher, Jane McGrath, Jennifer O’Rourke and Jill Casey. Referee A J Cronin.